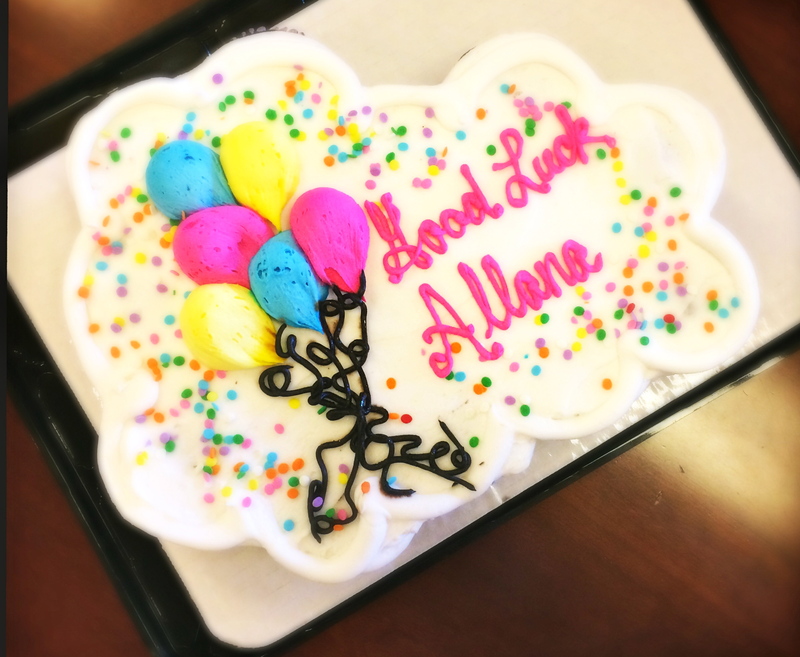 This past month saw me leave my first full-time agency job. After three years of unpaid internships, waitressing, a move to New York (and back! ), I finally secured a full-time job working in social media. Just over a year later, I decided to leave that job to take an even bigger risk: freelance. I first stumbled upon Blue Apron through one of my all-time favorite blogs, Cup of Jo. Blue Apron is a fantastic meal-subscription company that takes the difficulty out of meal planning. Every week, they ship you a box full of ingredients / recipes for 3 meals with 2 adults. ($59.94 for a weekly commitment, rounds out to $9.99 / person). You can skip a week, cancel at any time and best of all — they happily cater to your food needs and/or restrictions. Here’s the caveat though: I’ve never actually ordered anything from Blue Apron. See, Blue Apron has a blog. And all their blog posts have recipes. Utterly delicious recipes at that. After I first heard about what Blue Apron was doing, I was tempted to try out the service but wanted to test out a recipe from their blog first. I figured if the recipe was good, I’d give it all a go. When I saw the words, “ginger and soy” I was hooked. 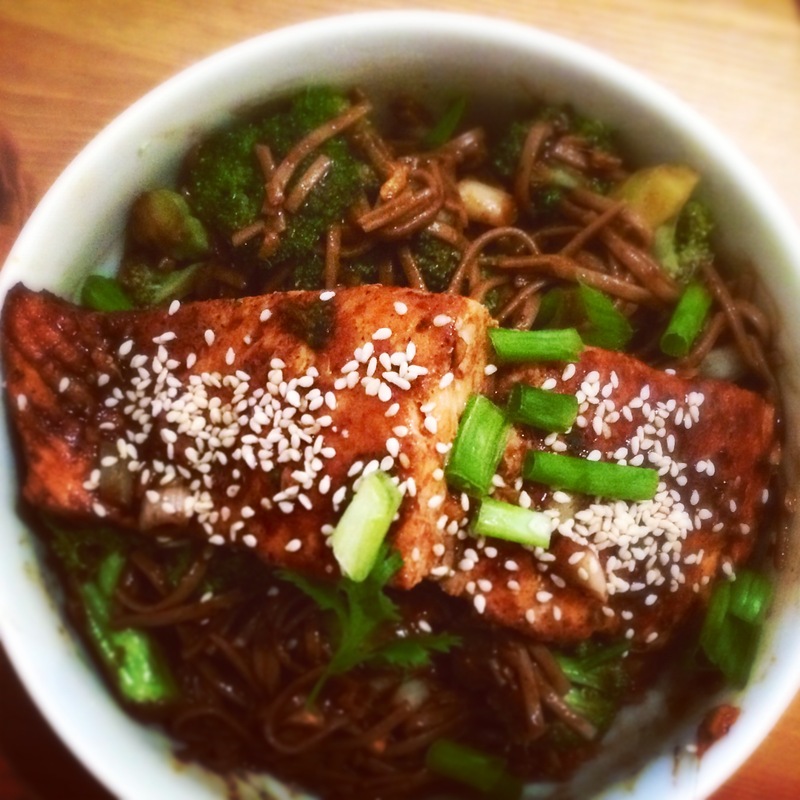 When I saw “salmon and soba noodles” I sprinted to the store. Thank you, Blue Apron, for bringing this recipe into my life. The fantastic thing about trying a new recipe is you not only collect a new meal to add to your arsenal, but you learn about new ingredients. With this recipe, I had never even heard of black bean paste. No, not traditional Mexican black beans but spicy and flavorful fermented soy beans that are pureed with garlic and all sorts of goodness. This sauce is essential for the recipe, so don’t skimp on it either. You can find black bean paste in most grocery stores (I found mine at Jewel in Chicago) or do some research online to see where it’s sold near where you live. The recipe also calls for buckwheat soba noodles, another unfamiliar ingredient I stumbled upon. I’ve certainly had soba noodles in dishes before in my favorite Asian restaurants, but I’ve never cooked with the noodle. My only suggestion is to follow the recipe, particularly when it talks about running the noodles through cold water after you drain them. Since you’ll return the noodles to the pot later in the recipe, you want to ensure the cooking process is stopped so they don’t become overcooked later. So far, in the past month or so, I’ve already made this recipe twice. The first time was with a girlfriend and we gobbled it up over glasses of wine and “Bachelor in Paradise”. (Guilty as charged, I know.) We found that the broccoli rabe was too bitter for the dish, despite it cooking down with all the herbs and sauce. Also, we didn’t have a citrus zester, so we were unable to add lime zest to the dish, which after making it the second time, I’ve realized is essential. I’d even grab two limes just to be safe – you can never have enough citrus! A few weeks later, I tried this dish out on my boyfriend. I picked up sesame seeds, which added the crunchy texture the dish was missing last time and an additional lime. I also substituted whole broccoli florets instead of broccoli rabe and can testify my second run with this dish was the clear winner by far. When asked to describe this dish in one word, my boyfriend replied, “Sensational”. S0, there’s that. 1. Wash and dry the fresh produce. Heat a medium pot of salted water to boiling on high. Roughly chop the broccoli rabe, separating the stems and leaves. Remove the salmon from the refrigerator to bring to room temperature. Peel and mince the ginger and garlic. Thinly slice the scallions on an angle, separating the white and green parts. Pick the cilantro leaves off the stems. Using a peeler, remove the green rind of the lime, avoiding the white pith; mince the peel to get 2 teaspoons of lime zest. Quarter the lime. 2. Once the water is boiling, add the soba noodles and cook 4 to 5 minutes, or until tender. Drain thoroughly and rinse under cold water for 30 seconds to 1 minute to stop the cooking process. In a small bowl, whisk together the black bean garlic sauce, sesame oil, lime zest, the juice of 2 lime wedges, ½ cup of water andas much sriracha as you’d like, depending on how spicy you’d like the dish to be. 3. Pat the salmon fillets dry and season with salt and pepper on both sides. In a large pan (nonstick, if you have one), heat 2 teaspoons of oil on medium until hot. Add the fillets to the pan, skin side down first, and cook 3 to 5 minutes per side, or until the skin is crispy and the fish is cooked to your desired degree of doneness. (Loosely cover the pan with aluminum foil to help the salmon cook faster.) Transfer the fish to a plate and lightly cover with foil. Wipe out the pan. 4. In the same pan used to cook the fish, heat 2 teaspoons of oil on medium-high until hot. Add the ginger, garlic, white parts of the scallions and broccoli rabe stems. Cook, stirring frequently, 1 to 2 minutes, or until the rabe has softened. Add in the sauce from step 2 and simmer for 1 to 2 minutes, or until slightly thickened. 6. dd the broccoli rabe leaves to the pan of glazed fish and cook 30 seconds to 1 minute, or until slightly wilted. Rinse the cooked soba noodles under water to loosen them, then add the noodles to the pan. Cook 1 to 2 minutes, or until thoroughly coated. 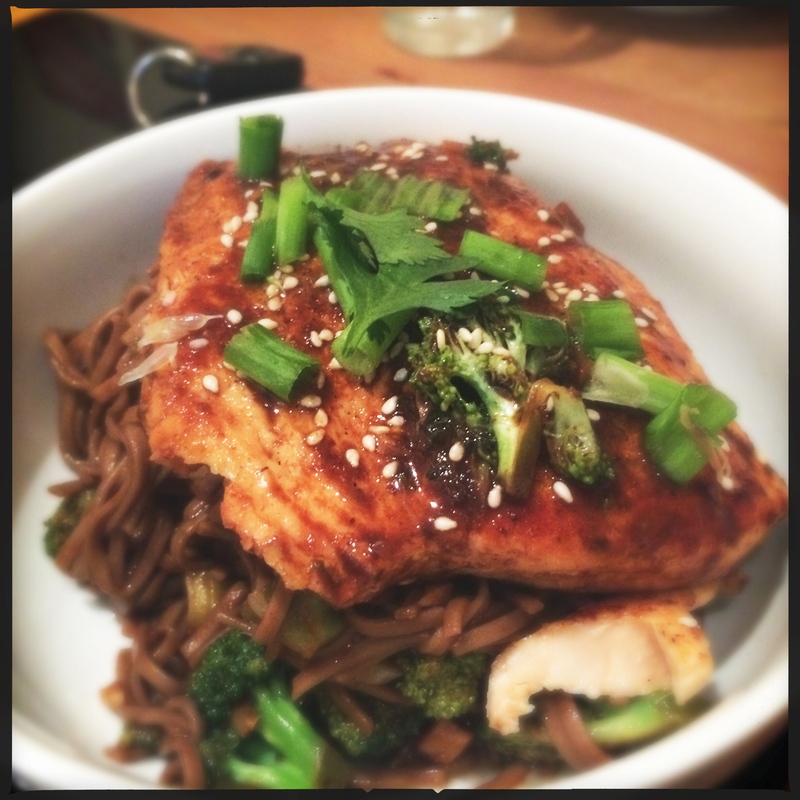 To plate your dish, divide the noodle-broccoli rabe mixturebetween 2 dishes and top with the salmon. Garnish with the white sesame seeds, green parts of the scallions, cilantro and remaining lime wedges. Enjoy! Gourmet Garden Herbs & Spices blog: Gourmet Garden is a company I started writing for over a year ago. Their products are the fresh herb and spice mixtures you will see in green tubes in the grocery store. I adore them! They cut down on cooking time, are not as pungent as dried herbs and their taco seasoning mix may be the best I’ve tried, ever. I’m going to be adding more blogs to their website in the coming weeks and am looking forward to trying new recipes with new mixtures. Additionally, I have been given the opportunity of attending a blogging conference next weekend, The Big Harvest Potluck in PA and will be covering the social media for Gourmet Gardens during the entire weekend. I’m looking forward to meeting fellow bloggers, cooking tasty new meals with the herbs and having a weekend foodie getaway like no other! Bridesmaids Uncorked blog: Anyone here a bride and or bridesmaid? If so (shameless plug), you should swing by this blog! I’ve written three posts so far and am looking forward to many more: 1) The Costs of Being a Bridesmaid, DIY 101: Shower Invitations and Late Night Wedding Food. Can I use onions instead of shallots? Is there much of a difference? Aside from a slight difference in taste (shallots are on the sweeter side compared to onions) and in texture (you’ll notice minced onions have more of a “presence” than minced shallots), I don’t think it’s a problem, Ryan! I love both and use them together and separate quite often. What are you making?? Just read this and all those bridesmaids posts. Love it. You are the cutest ever. You make the food sound so good. I challenge you to try a vegan recipe so that I can try it too. Challenge accepted! I can’t wait!